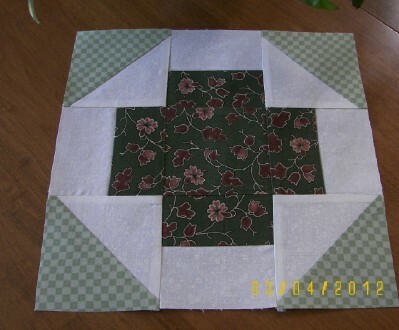 This cute block is our Guild BOM, Greek Cross, for March - EASY. I am visualizing those corners from other members' blocks, and how they will result in pretty quarter square triangles where all the corners meet. As usual, one "ordinary" block will be gorgeous, when we see all of them together. This one is so much prettier than I thought it would be! Hope I win! I've also been watching the Eagles and their eggs at http://www.ustream.tv-decoraheagles/, the link that Lynn of Nebraska Views kindly sent me after she read my post about driving to see the eagles at Kingsley Dam. Watching them via the eagle cam is so much better than anything! Watch out, it's addictive! I really enjoyed watching the mouse who thought he'd like to investigate the nest, but almost met his death when one of the parents swooped from nowhere and almost caught him! The cam changes views, and the last time I looked she had 3 eggs. I had no idea how fascinating all these animal cams could be! I'm still here, but working on the Guild Serendipity (Raffle) Quilt. The binding was finished this morning, and I have one small problem to correct. Unfortunately, I can't show it yet -- not until the "big reveal" in June. However, I HAVE learned a valuable lesson about sewing on piping with a zipper foot (what I had) vs. a piping foot (didn't have)! After much aggravation with my zipper foot (square shaped underneath) vs. the piping foot (rounded shaped underneath), I was happy to fork over my $10.00 for the piping foot -- Dad always said, "Use the best tools!" You are right--those ordinary blocks make gorgeous quilts--that and the serendipity of several different people's choices. I love seeing how simple blocks can become so different when joined together. The placement of colors/values can make such a big difference. I too am still checking on the Bald Eagle pair and remember from last year after the chicks were hatched it was even more addictive. The camera is so much better this year too as more detail shows up - one day the camera was zoomed up on the female on the nest. You could see the feathers so clearly and even see the movement of her breathing...amazing. We watch the bald eagle family too. My husband and some buddies drove to the Decorah area last year (about 2 hours east from us here in northern Iowa) to visit a fish hatchery, but they knew the big cottonwood tree with this eagle nest was nearby and sat and watched "in person" for a while. I saw your comment on the Rogue Quilter's blog about the DVDs and books by the Pajama Quilter. Her method sounds more my style than formal, perfect quilting. What's the difference between her Rethreaded and her Reloaded books? I assume one is simply a sequel. Are they stand alone books? Do you recommend one more than the other? Your March BOM is going to be great with the other blocks. I envision a really wonderful quilt. I hope you win the blocks, too. Good luck. LOL!! I went through the exact same piping experience about 3 weeks ago. Gladly paid for a piping foot afterward even though I don't have a piping project on the immediate horizon. I know I'll be happy for it later on sometime. Those blocks will have a nice secondary pattern. And thanks for the info you sent Vivian on the PJ quilter books/DVDs. She forwarded it to me, since I had similar questions. I am in agreement with your dad....you know I have a lot of feet, second only to the dealer. I find they are made to make our lives so much easier!! Your block will make a lovely secondary pattern - good luck on winning.